*Day 45 was a rest day! Day 46: Probably one of the shorter trails we're going to have to walk, the Cavan Way starts in the same town as where we finished the Miners Way. The maps and information boards talk about the walk in two sections, so I'm going to use the same halves to keep things simple: Dowra to the Shannon Pot / Shannon Pot - Blacklion. The first section of that goes from Dowra to the Shannon Pot is about 12km. While the walking for this bit was mainly on road, the off-road sections are quite boggy, meaning slow walking. This does make the ratio of "road vs trail" feel like 50/50, even though it's about 80/20. The reason for this 50/50 feel, is how much time you spend doing each one. In 1 hour, we would walk around 4km on road- however, in the same amount of time walking in the bog we would only move 1.5 - 2km. 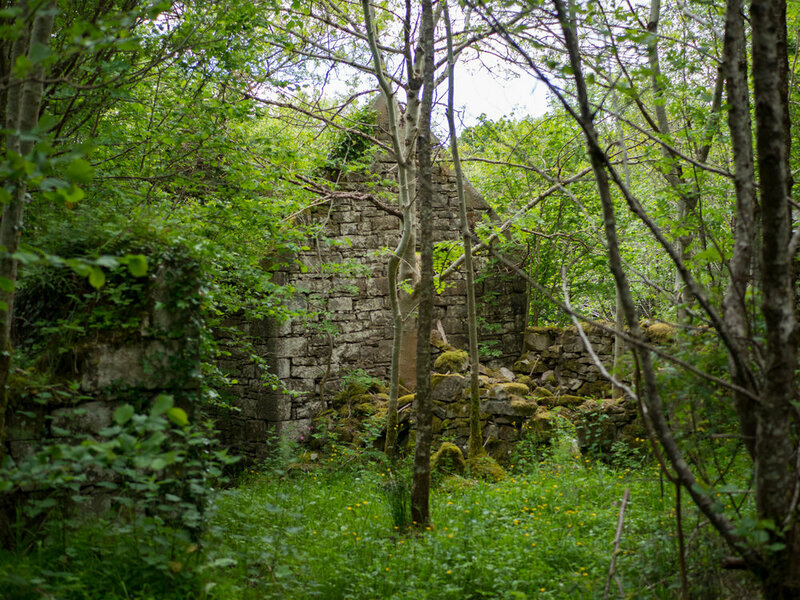 There are lots of small ruined cottages and farmhouses. I think this place had a lot of migration in the past, and the bog just took over. We met a local farmer at a bend in the road. He was walking through his field and we talked over the ditch for a while. He told us the name of a breed of cows to look out for - to me it sounded like he said lozenges, or maybe it was limousines. Apparently they're the frisky ones. I didn't want to tell him how every kind and colour of cow we had met had been fairly even in their likelihood of chasing us. He also told us that the small footbridge we were going to cross further along the trail used to be the only bridge for locals to cross the river Shannon with for many years. So if you were heading to Sligo that was your only way of crossing. It could take a horse or donkey, but is far too small for any kind of car. The Shannon Pot is a small pool that is the overland start of the Shannon River, the longest River in both Ireland and the UK. it felt like the kind of pool that would be the home of nymphs, or where some resonance painter would have had young girls dancing naked with flowers in their hair. Probably white hawthorn garlands, the land around there is full of it and gave everything a clean and innocent feeling. A bit down the trail we detoured to find a geocache at lake Garavagh. Looking back its pretty comical. The lake is used in a lot of tourism photos for Cavan, and I was expecting somewhere really gorgeous, and maybe even a campsite. As we walk down past some farmhouses, we start to see "Contamination!" signs appearing on the lane-side. The closer we get to the lake, the more we see. The lake was full of pinky-red algae and "Contamination!" signs. It kind of smelt funny, and it looked more like a water treatment facility than a lake. Obviously it was having a bad day. 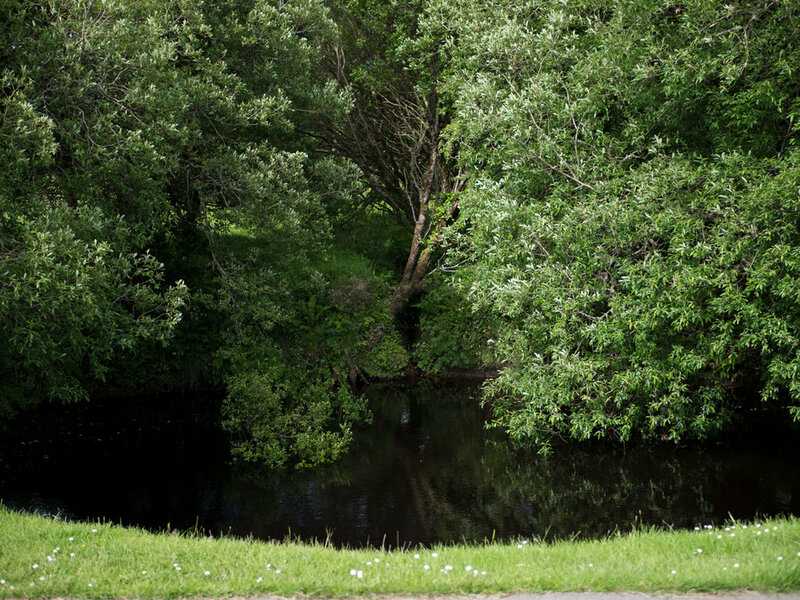 The legend surrounding the lake is that years ago it was the location of a lot of poitÃ­n brewing (Irish moonshine). When the officials tried to surprise and seize the brewers, they threw the barrels into the lake. When they returned at a later date retrieve the barrels, they hand been sucked along underground rivers and appeared in the Shannon Pot. 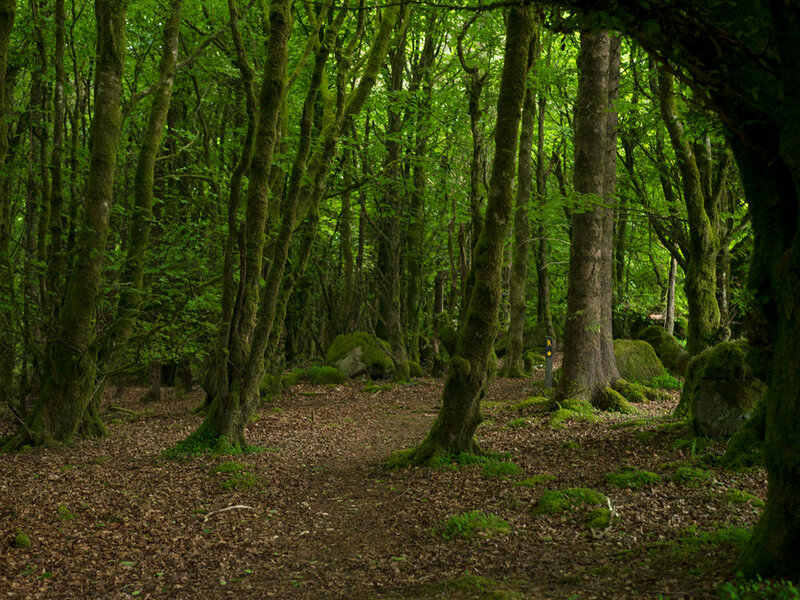 We continued on walking, aiming for a forest section near the Cavan Burren. I didn't realise that the Cavan Burren sits on a plateau-like area, with very steep sides, making it look like someone just pushed a building block up out of the ground a bit. As we left the lane we had been following and went to start this intense climb, we noticed that we weren't alone in the field. The cows were fine, but the very large bull was not. Being able to see our exit point, and also the forest where we'd be stopping, we decided to go for it. For the first half of the field he didn't notice us. Once in the second half he started very slowly walking towards us. We got to the opposite wall, only to notice a large hole in the wall, and therefore giving us no relief. Right in front of us was the scramble. Huffing and puffing we started to pull ourselves up the slope with hands, feet and anything else that moved our slightly panicking hearts upwards. About half way up I stopped to try and remember how to breathe, and looked back down at the gap. The bull was silently standing there watching us. He didn't look like he had any intention of moving, and I'm not sure he could have got his massive bulk of muscles up such a steep slope if he had wanted to. But it was still enough to motivate me to finish falling upwards and climbed over the final style into the forest. Now that it's summer, setting up a tent after 6pm in a forest is torture: midges are everywhere, eating any slip of skin that is uncovered (as well as magically getting at some of the covered areas too). My lower back had 15 large welts for the rest of the week. 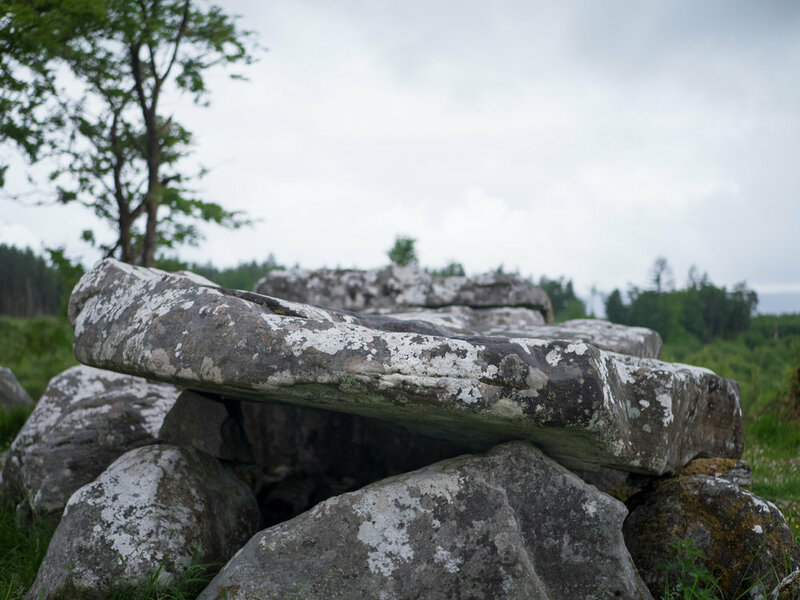 Day 47: The next day we got moving early for a change and arrived into the Cavan Burren. Now, it's not the bare karst landscape that automatically springs to mind. It is a karst landscape, but many years ago people had planted it with forestry so as to make use of this large area stone and sink holes. So there is a mixture of soil and trees and moss and rocks, not just the bare ground I was expecting. It was still an incredibly interesting place, with the densest population of prehistoric-tombs (mega-/neo-/all-the-lithic's). One gorge was known as the giant's leap, where legend has it two male giants were competing for the attention of a female giant. As as contest one challenged the other to jump over a large gorge. When both giants succeeded, the first then said he could jump it facing backwards. He leaped into the air but didn't make it and died from the fall. His tomb lies on a nearby hill. 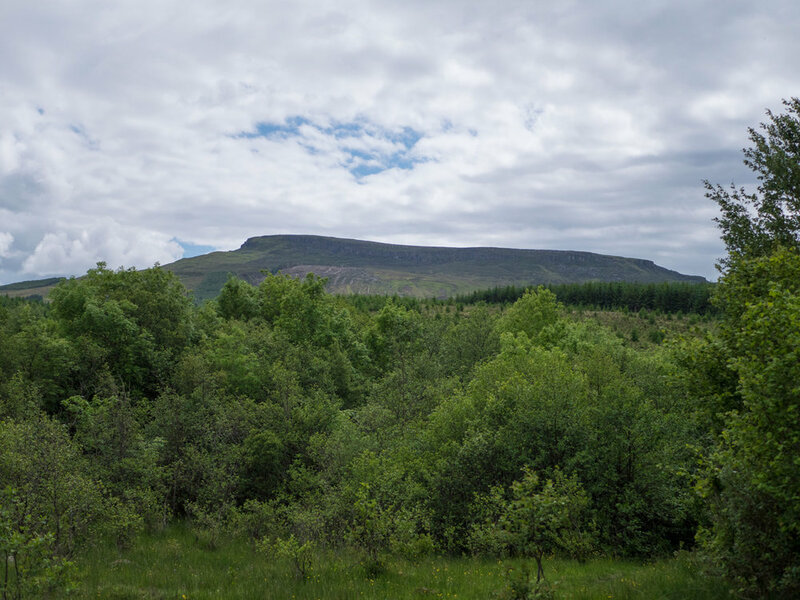 Technically the trail only walks along the edge of the Burren Park, but there is the option to walk in along the smaller park loops, which we did. Everywhere was shrouded in mist and all day it gently rained, which instead of making the day feel like a long trudge gave the place a mystical and alive feeling. I don't know why the trail doesn't automatically bring you properly into the park and around more of the impressive tombs. It's very easy to think you'll go and look at all the interesting things that are close to the trail, but I find that when I've already walked 15km that day, I end up not bothering to take the 1km diversion to go see something and instead just want to get further along the official trail route. I was glad that we took the time to divert off and see all of the Burren as opposed to its outskirts. The final stretch into Blacklion was great, as when we got to the far side of the plateau we got to look down at the village we were coming into, which makes you feel like you've almost finished, even if there is another 5km to go. The fields on the other side of the plateau were full of sheep, which are always fun to walk with. Then the fields lead to small lanes and tiny backroads for the final stretch. What was nice about doing such a short trail after doing the Miner's Way, was that we felt like we were getting somewhere again by completing another trail so fast, even though that's not really how it works.